Hey guys! 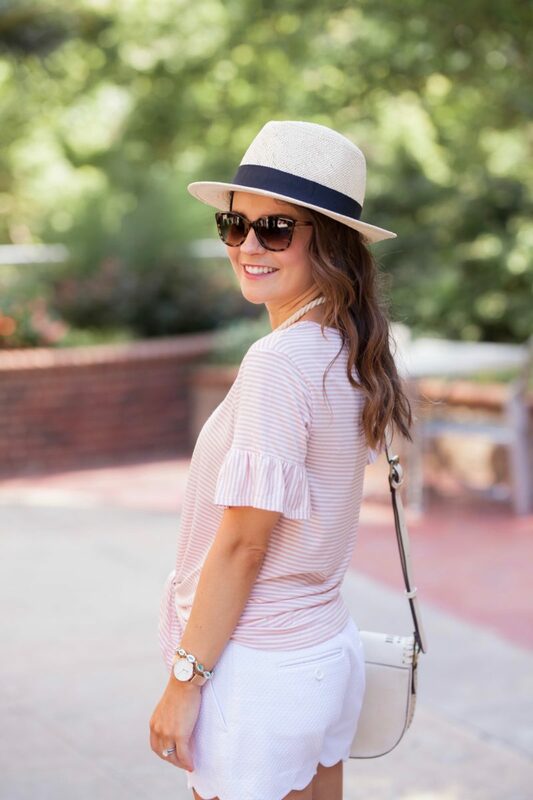 So today I’m taking a little break from talking about the Nordstrom sale to share a fun summer outfit, because it is July after all. On Wednesdays, we wear pink! Y’all, this striped top from Bobeau is a new fave. I love the ruffled sleeves and the tie in the front plus it is soooo soft. And if you’re not into light pink (even though I think it’s the cutest), it comes in 5 other colors. I will be wearing it into the fall and think it will look so cute layered under a chunky cardigan. 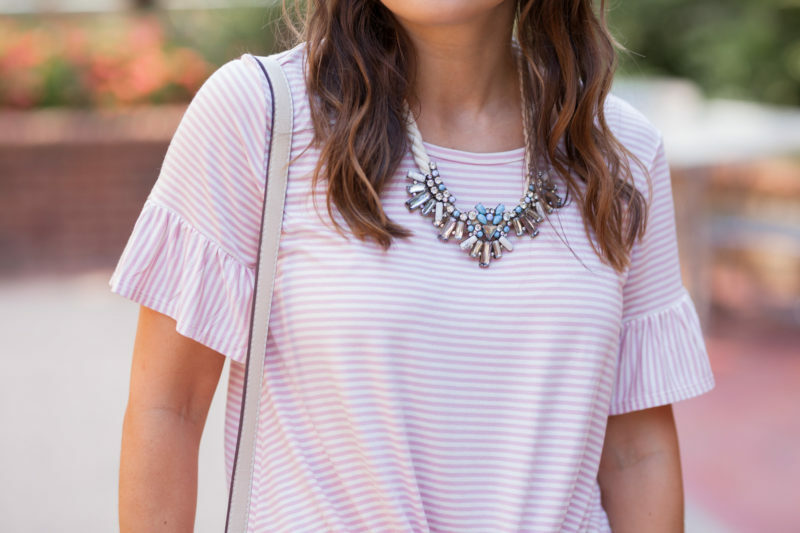 To accessorize, I threw on this statement necklace (first seen here)- I think it’s the perfect accessory to add some interest to a basic tee. Now, let’s chat about these white scalloped shorts. I picked them up a while ago during the Shopbop sale and like that they have a slight texture to them and the quality is excellent (aka they’re not see through). They’re currently on sale for under $45 and come in a few different colors too. If you want an even more affordable version, check out these from J.Crew Factory. I love that tie front top! Too cute paired with those shorts! Great minds think alike girlfriend!! ha! I am wearing this exact same shirt today! Isn’t it SO cute! Loving it paired with these white shorts! Love this look so much! That color is definitely one of my favorites. This top is so cute and I love the shorts!! gorgeous! love these neutrals for summer! The gingham and scallop shorts are to die for together! So cute! 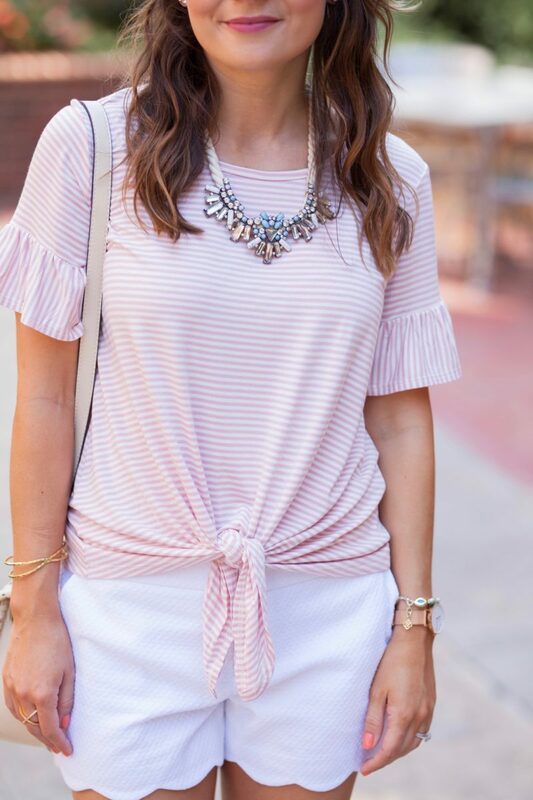 Love that top and of course anything with scallops! What a darling outfit! Love the scalloped details on the shorts! 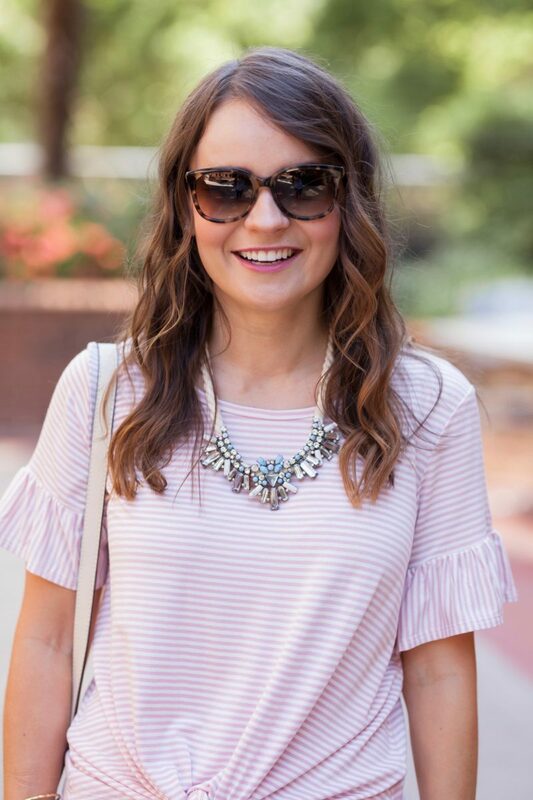 Such a fun, girly look! Loving the scalloped shorts! The cutest top AND shorts!! Such a fun outfit! LOVEEE this outfit! The light pink and white goes so nicely together! 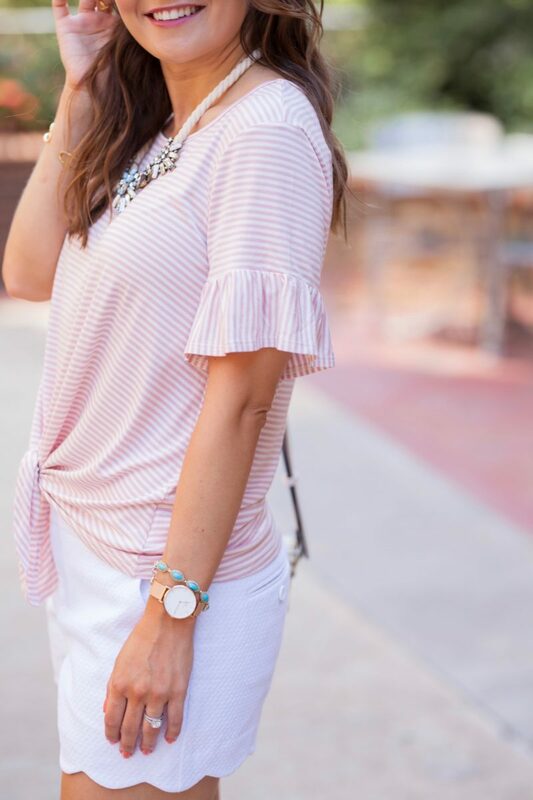 Makes for the perfect summer outfit!